Surely you've had success with a certain business technique or strategy. Submit your best business technique or tip using the form below. We are currently working on several projects, one of which is the "101 Chair Massage Business Techniques". If we use your submission, we'll give you free access to this valuable online resource once it's available. 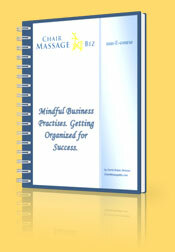 Make sure you sign up for the free "Chair Massage Business" newsletter before you leave this site so you don't miss knowing about the many valuable resources as they become available.